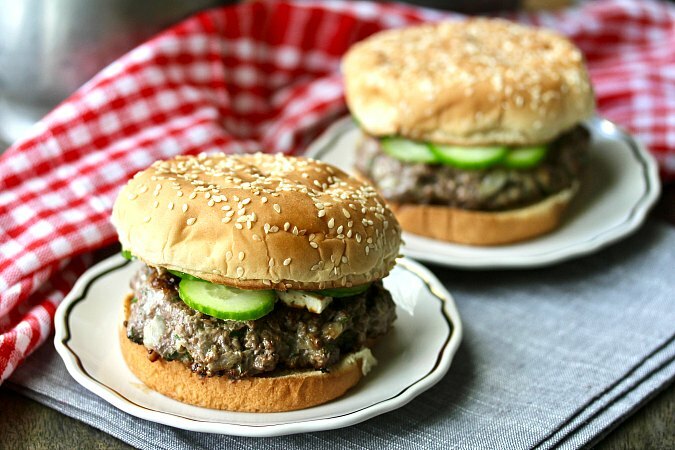 These Greek-style Lamb Burgers take the traditional American burger to a different level. The lamb is seasoned with onions, garlic, mint, and parsley, and then cooked on a hot grill or grill pan. What I enjoyed about making these lamb burgers is that you actually get to make your own ground lamb in your food processor. I bought one and a half pounds of boneless lamb chops, cut them into chunks, added the chopped onions and herbs, and pulsed away until I had a beautiful mixture of seasoned ground lamb. Now that I know that I don't need a special meat grinder, I can't wait to try making my own ground beef, pork, and seafood for burgers too! We really enjoyed this twist on grilled burgers. I'm a huge fan of lamb, and love Greek flavors. In addition to the tzatziki sauce, I also spread these burger buns with a schmear of spicy barbecue sauce. This addition was decidedly not Greek, but the hot and cool contrast was delicious. It's up to you. You can also add cheese to these burgers if you like. 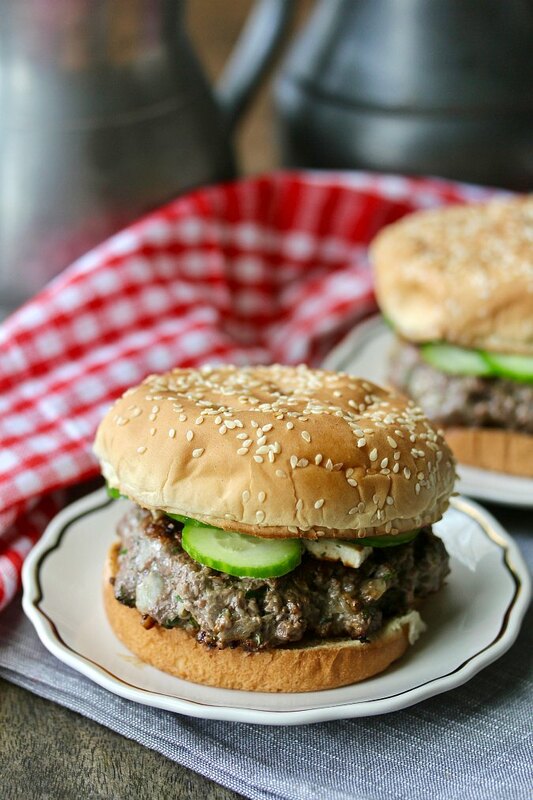 I crumbled some feta cheese over the top, but mozzarella would be great (and more melty) on these lamb burgers too. By the way, if you love Greek food, check out my friends Mirelle and Panos' blog, Little Cooking Tips. They blog from Greece, and have a large index of authentic Greek recipes. They also share photos and stories of their beautiful country. This recipe has been slightly adapted from the book Mark Bittman's Kitchen Matrix: More than 700 Simple Recipes and Techniques to Mix and Match for Endless Possibilities. Over 700 recipes in 300 pages! This recipe came from the section, Burgers +9 Ways. The section contains three seafood burgers (a tuna burger, a salmon burger, and a delicious sounding burger with shrimp, scallops, corn and bacon), three pork burgers, and three lamb burgers. I can't wait to try them all. I'm spending a year cooking through sections of the book with Wendy of A Day in the Life on The Farm and Camilla of Culinary Adventures with Camilla. Keep an eye out every Tuesday for our weekly posts. After the recipe, be sure to check out the burgers that Wendy and Camilla made. Grate the cucumber, sprinkle it with a pinch of salt, and place it into a strainer over a bowl to drain in the fridge overnight. Whisk together the yogurt, garlic, oil, vinegar, and the remaining salt, cover, and refrigerate overnight. The next day, combine the cucumber, yogurt mixture, and dill, and refrigerate until ready to use. Place the lamb (including fat), onion, garlic, mint, and parsley in the bowl of a food processor, and using the blade, pulse until the meat is ground. Shape the ground lamb into four patties, and grill, about 5 to 10 minutes, depending on grill heat and the thickness of the patties. Near the end, top with the sliced cheese to melt. Spread the buns with some of the tzatziki sauce and some of the optional barbecue sauce. 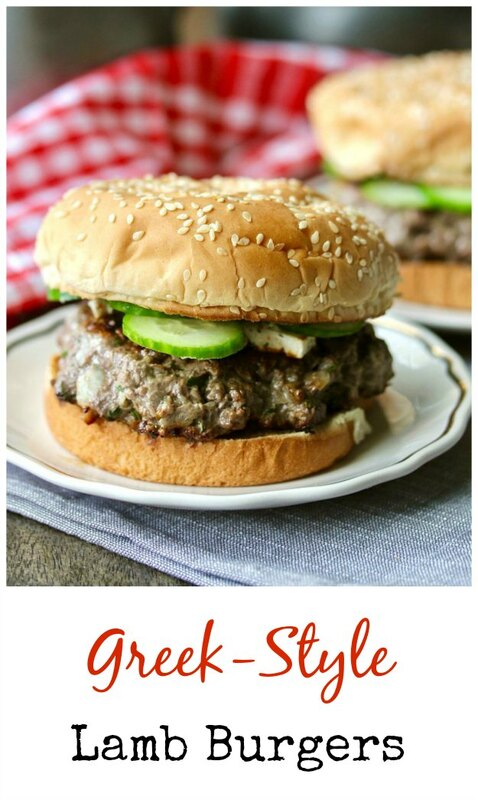 Place the burger on the bun, and top with sliced cucumbers. These sound so good to me. I am the only lamb eater in my house unless my daughter, Jessica, or my son, Chuck, are over for dinner so I didn't make them. I did, however, go to a restaurant last nigh that was serving lamb burgers. They were amazingly delicious. Lamb used to be so much more popular than it is. I still love it! We LOVE lamb burgers!! I don't know why I don't use my food processor more often to make ground meats. I've done duck breasts that way. I will have to try lamb. Soon! It was a revelation for me! Thank you SO MUCH for the shout out and the kind words Karen!!! It truly means a lot, especially coming from you, an accomplished blogger, a talented chef and baker and a wonderful, warm person. It's an honor. Awwww. You are so sweet!